Obsessed with the third photo. I’m so excited to come to the book signing tomorrow evening!! The girl in the first picture… she’s naturally elegant, sono frenchie! So much of great looking models there! GrEaT ShOcKiNg skirt in the first pic ! one of my favourite brands! Wonderful two tone pleated skirt in the first picture – elegant with a modern twist. Such great styles, my favourite is the third one, really love it! Love the first look! The ombre skirt that fades into a lighter colour is amazing! On my wishlist..
Bad batch of clothes – boring and plain. The first one looks like she was standing there when they went by spray painting the wall. The black and white shoes are great, tho. All very different looks and all are simply lovely…..The ombre skirt is divine. The street of Paris are so fashionable. The second shot is my favourite, once again great shots! The fourth shot is so beautiful. Caravaggio’s style: from the dark. Great jewelry on picture #2. The more I look at all these different, exciting styles, the more I miss Paris and life in a big city so much. Nice. I really like the pictures! i love the guy in the 2nd photo with those boots and that great hair! shoot, i meant the 3rd photo. I cannot get over these photos – great job! After all the bling in Milano, these fotos ( and Part 1) are so interesting and inspiring. I always look forward to the Dries Van Noten show–especially because he puts things together so well. It seems like the people hanging around, before and after, are totally inspired by the DVN aesthetic. 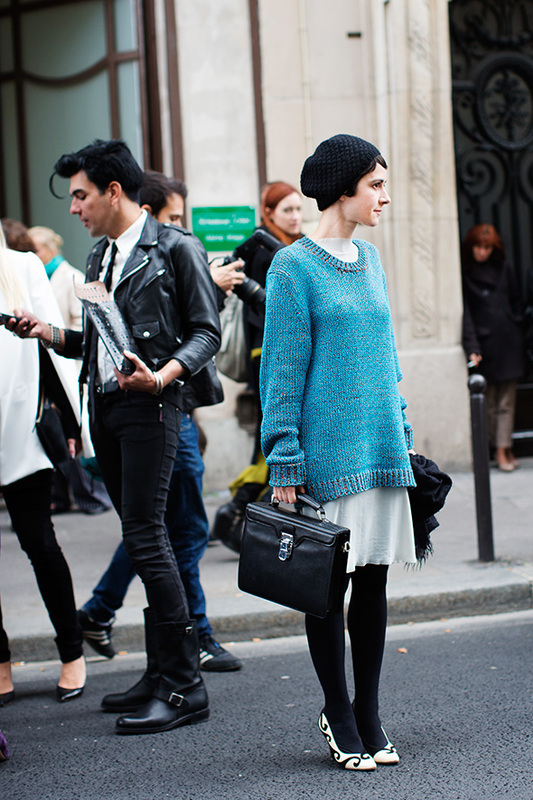 the long blue sweater over the skirt. comfy and warm. Gorgeous people. gorgeous outfits, gorgeous photos! Texture, appears effortless although thought was there. And red lips. Love. 3rd photo is Magic. An ‘Opera’ of Personalities. The Cyan Blue Sweater is Smashing. Great Photo! 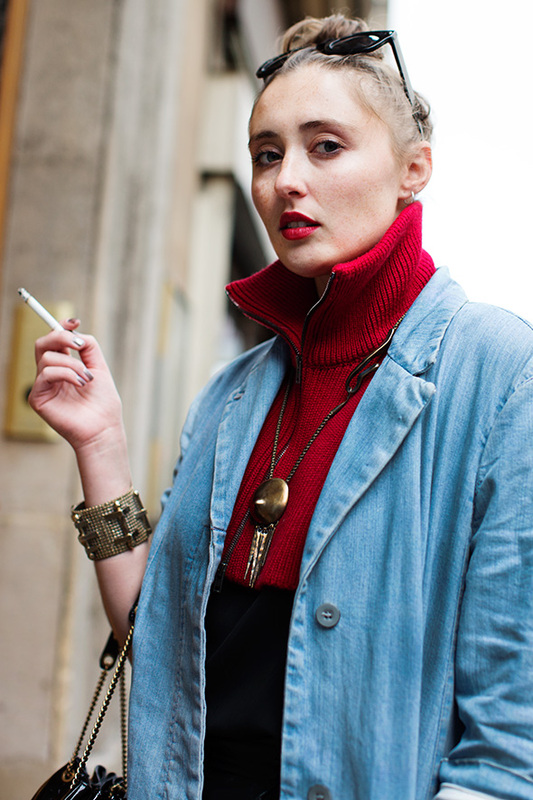 Can you show us Paris ghetto look, or does everyone in Paris wares designer threads? Guy looks silly in those skin-tight jeans. How FAB are all these people? I LOVE the accessories and jewelry some of them have! Love the rockabilly dude in the 3rd photo. The 4th look is really nice, too… understated & cozy but striking. Great photos! I especially love the 4th photo, she looks effortless and beautiful! Beautiful shots! Love the skirt of the first woman! I love the first and last look; really beautiful and brilliant. I’m in love with it. Thank you for sharing. Very colorful. Nice. I like the third picture best. As if we weren’t sure that oversized coats are in! Now, these are real street styles! Great pictures. Love them. Love the thirth picture! Innocent look..
Love the ombre skirt and 3rd oversized sweater. 1) I simply cannot believe people are fawning over this outfit. Totally looks like a Glamour magazine “Don’t”. Love the Chanel bag and shoes and jacket, though. 2) I don’t personally like this outfit, but I like the elements – the jewellery, especially, her hair, sunglasses, and make up. 3) I love combining textures – my first instinct would be to combine those ridiculously fabulous shoes with a tailored jacket. Not sure about the sweater, but boy, this IS an outfit, and she’s workin’ it. I love the dude in the background with the Elvis hair. 4) This is a beautiful shot of a young woman combining textures and fabrics in a way I adore. Woo, major 80s flashback with the first 3 pics. The third one is the best, no doubt. She puts everyone on this page and the following ones to shame, what dior girls???!!! This is style. love it all! especially love the shoes in the first picture! Wonderful skirt and great shoes in the first picture. Would love to see the girl in the third one wearing these..